It has been requested that the title of this article be changed to Molotov (disambiguation) . Please see the relevant discussion on the discussion page. Do not move the page until the discussion has reached consensus for the change and is closed. Look up Molotov in Wiktionary, the free dictionary. A Molotov cocktail, also known as a petrol bomb, bottle bomb, poor man's grenade, Molotovin koktaili (Finnish), polttopullo (Finnish), fire bomb or just Molotov, sometimes shortened as Molly, is a generic name used for a variety of bottle-based improvised incendiary weapons. Due to the relative ease of production, Molotov cocktails have been used by street criminals, protesters, rioters, criminal gangs, urban guerrillas, terrorists, hard-line militants, anarchists, irregular soldiers, or even regular soldiers short on equivalent military-issue weapons. They are primarily intended to ignite rather than obliterate targets. Molotov is an EP by The Bruisers. It was released on Cyclone Records in 1998. It was the last release before the band broke up. Oktyabrkənd is a village in the Kalbajar Rayon of Azerbaijan. Perm is a city and the administrative centre of Perm Krai, Russia, located on the banks of the Kama River in the European part of Russia near the Ural Mountains. Molotov was a Project 26bis Kirov-class cruiser of the Soviet Navy that served during World War II and into the Cold War. She supported Soviet troops during the Siege of Sevastopol, the Kerch-Feodosiya Operation and the amphibious landings at Novorossiysk at the end of January 1943. The Iosif Stalin-class passenger ship was a two-strong class of large turbo-electric powered passenger ships, operated by the Soviet Baltic State Shipping Company (BGMP). The ships were taken over by the Soviet Navy during World War II and used as transport vessels. The class was named after Joseph Stalin. This disambiguation page lists articles associated with the title Molotov. The Soviet–Japanese Neutrality Pact , also known as the Japanese–Soviet Non-aggression Pact , was a neutrality pact between the Soviet Union and Japan signed on April 13, 1941, two years after the brief Soviet–Japanese Border War. The pact was signed to ensure the neutrality between the Soviet Union and Japan during World War II, in which both countries participated. Polina Semyonovna Zhemchuzhina was a Soviet politician and the wife of the Soviet foreign minister Vyacheslav Molotov. 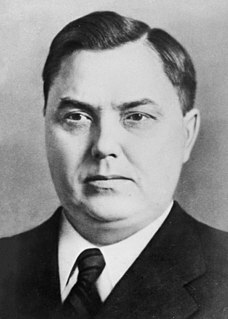 Zhemchuzhina was the director of the Soviet national cosmetics trust from 1932 to 1936, Minister of Fisheries in 1939, and head of textiles production in the Ministry of Light Industry from 1939 to 1948. Shvernik Commission was an informal name of the commission of the CPSU Central Committee Presidium headed by Nikolay Shvernik for the investigation of political repression in the Soviet Union during the period of Stalin. Other members were Alexander Shelepin, Zinovy Serdyuk, Roman Rudenko, Olga Shatunovskaya, N. Mironov, and Vladimir Semichastny. The 14th Congress of the All-Union Communist Party (Bolsheviks) was held during 18–31 December 1925 in Moscow. The congress elected the 14th Central Committee. The 18th Congress of the Russian Communist Party (Bolsheviks) was held during 10–21 March 1939 in Moscow. It elected the 18th Central Committee. Vyacheslav Alekseyevich Nikonov is a Russian political scientist. The following lists events that happened during 1933 in the Union of Soviet Socialist Republics. The following lists events that happened during 1934 in the Union of Soviet Socialist Republics. The following lists events that happened during 1936 in the Union of Soviet Socialist Republics. The following lists events that happened during 1938 in the Union of Soviet Socialist Republics. The following lists events that happened during 1932 in the Union of Soviet Socialist Republics. The following lists events that happened during 1935 in the Union of Soviet Socialist Republics.